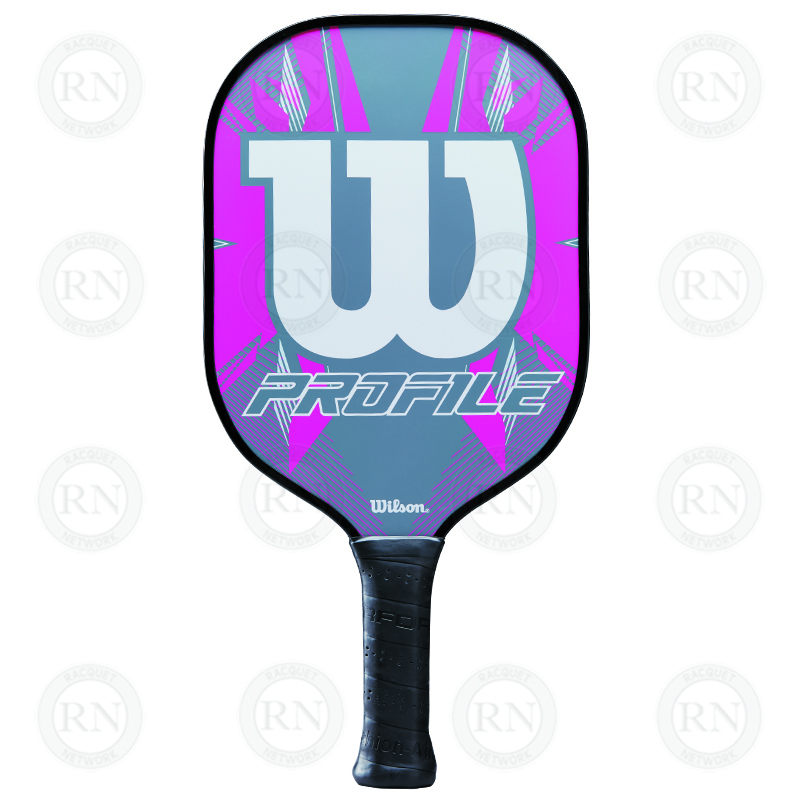 Wilson Profile pickleball paddle. Online offer only. Not valid in-store. Limit of one per order. This is our top selling pickleball paddle. It is equal in every respect to Manta’s Extreme .5 series and is a better paddle than the Selkirk Neo. It is designed for players at all levels and we can assure you that we know hundreds of players at all levels using this paddle on a daily basis. 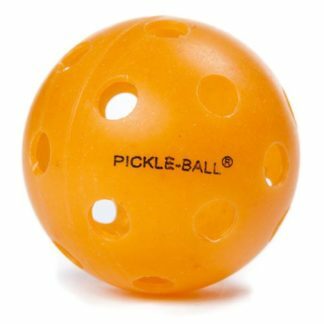 We believe it is the best value in pickleball today. 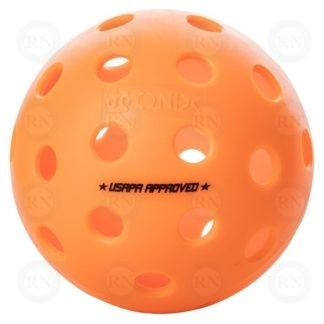 Features a Graphite-Composite Hitting Zone, Polymer Power Power Comb Technology, Shock Stop Dampening Bumper, and Cushion Aire Perforated Grip. This paddle is engineered for durability and reliability on the court. Janet Wolney. Demo card feedback. 28 DEC 2018. Connor McLean. Demo card feedback. 19 OCT 2018. Danica Smith-Hodgson. Demo card feedback. 11 OCT 2018. Rashid A. Demo card feedback. 15 AUG 2018. Wojciech Kmiecik. Demo card feedback. July 13 2018. Tom McKenzie. Demo card feedback. 27 MAY 2018. Mary Pilon. Demo Card Feedback. 9 MAY 2018. Ron Ropchan. Demo Card Feedback. 23 APR 2018. Shannon Adair. Demo Card Feedback. 11 APR 2018. Marie Franz. Demo Card Feedback. 26 MAR 2018. Shelley Boyer. Demo Card Feedback. 16 Jan 2018. Joe Chan. Demo Card Feedback. 17 NOV 2017. Very impressed. Staff were very helpful and very patient. My wife and I each bought one of these and we are very happy with our choice. Thank you for the excellent service. I love my Wilson paddle. I am a new player and I did not want to pay too much to start with because I am not sure if I will play pickelball for a long time. So I bought this one and so far I like it very much. I tried several paddles during my one month demo period. I was initially afraid of this one because there were players in our group who warned me that Wilson paddles were no good. But not matter which paddle I tried, I kept coming back to this one. For some reason I just seemed to play better with this one than with any of the others. In the end, I asked the Racquet Network staff to extend my demo period by a couple of weeks because I wanted to be sure. They were very nice about it and let me take my time which I am very glad of. Eventually I chose this one as the best of all for me. Thank you for taking time to review this paddle, John. We understand that there are players out there who are eager to disparage Wilson pickleball paddles. In our experience, the Wilson profile is comparable to paddles that sell for twice the price. We are pleased to hear that this is the right paddle for you. Melissa D. Demo Card Feedback. 28 JUL 2017. Bought four of these today because they guy in the store said the ratings were good. Took them home. A group of 10 of us used them for three hours including some friends who play in Arizona. Everybody, even them, was impressed. They said this is the best $60 paddle they have ever seen. So thanks for the recomenation. $60!!! What a steal. This is an amazing paddle. I was told by a friend that goes to West hillhurst pickleball club that Wilson makes terrible paddles. This paddle gives my so much power. I was making shots that I have never made before. I am very happy with this paddle and this will be my primary paddle for playing. I’m going to get another paddle as a backup and will recommend Wilson paddles to all my friends. I am very happy with this purchase. I have been playing for several years. I bought this for my husband who has started playing only recently. I wasn’t sure how much he would be playing, so I didn’t want to spend too much. The first time we played with it, I asked him if I could try it just so I could see how it was. I liked it a lot, so I borrowed it again the next day. After playing with it three times, I came in a bought my own. I think I like it even better than the Manta I bought last year. 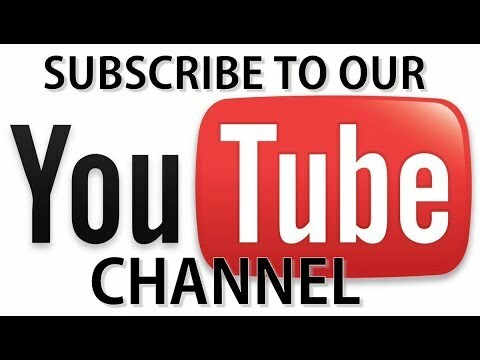 Thank you so much for the recommendation. I had been told by a guy at our club that this paddle was too heavy to play with, but I can see now that he didn’t know what he was talking about. Switching to a heavier paddle immediately improved my game, just like you said it would. I am now more consistent than I ever was. Thank you so much for the excellent advise. I was told this Wilson paddle was a crap paddle by a pickleball coach. Instead, he wanted me to buy one that he sells himself. So I did. Then I came into the store and talked to Brent. He suggested that I demo one of the new Wilson paddles to compare. 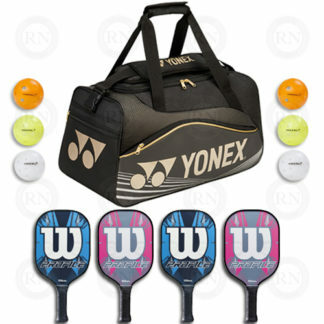 After one week I could see that I played better with the Wilson than the Onix paddle that the coach sold me. I don’t even like the Onix one anymore but he won’t let me sell it back. So I am stuck with it. But the part that really makes me mad is that this so-called coach is not even really a coach. He’s just a good player who calls himself a coach. Pickleball has a serious ethics problem, Doug. We share your frustration. All of our pickleball coaches are NCCP certified. All have completed the “Making Ethical Decisions” module, which has been set as a national standard for coaching in Canada. Our coaches understand that coaches have an obligation to tell students the truth. Sadly, Pickleball Canada does not require their coaches to adhere to ethical standards. Nor do they provide ethical training of any kind. The result is a lot of unethical people who call themselves “coaches” or “ambassadors” who then use their influence to help some brands and damage other brands. However, we are pleased to see that some people, like you, are sceptical and insist on testing what they have been told rather than simply accepting it. I bought this today on my way to pickleball. It is awesome. Everybody who played with it was impressed. Nobody could believe it was a Wilson. Normally their paddles aren’t very good. This one is though.